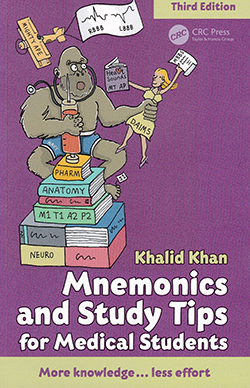 Practice development nurse Valerie McGurk reviews Mnemonics and Study Tips for Medical Students (Third Edition). What a fun little book. This pocket-sized revision guide gives the reader lots of tips, tools and tricks to aid clinical learning. Now in its 3rd edition, this is a memory aid book that’s made fun, even causing me to laugh out loud in some places. Chapters include anatomy, pharmacology, microbiology and infectious diseases. The content is organised and well presented. It is clear and colourful. The author has also included space for the reader to make their own notes. Learning is aided through websites and study tips. This book is a valuable source of information for undergraduates who are required to remember a vast amount of facts and figures. Although the title suggests it is for medical students, it would also be a great resource for nursing students and other professionals working within the multidisciplinary team. A definite recommendation.